Fears of the dentist and dental work are very common. They can keep you from seeking the care you need, which can lead to dental issues worsening until the situation becomes urgent. By the time you get to us, our sedation dentistry options, our implementation of advanced technology, and our personalized care will make you wonder what kept you away, because these elements can make your appointment feel like a breeze. Whether you’re anxious receiving routine care or you’ve got extra time in the chair scheduled, we’re here to make you comfortable. Sedation options make this goal easier to reach. For as long as dentistry has existed, fears of the dentist have, too. We understand it isn’t always easy to open up and say “Ahh”. Because of how common the fear was and is, dentists had to learn not take it personally, and instead think of ways to help patients get the care they need with less anxiety. Enter: sedation dentistry. You’ve probably guessed from the name that it involves the use of a sedative, which helps ease both your mind and body into a relaxed state. There are several different types that can be part of your treatment plan, based on your level of anxiety and your unique needs and preferences. Sedation dentistry can help nearly anyone get the care they need. We’ll go over your medical history, which includes allergies we should be aware of, current medications you take, and conditions that may interfere with it working as it should—then we’ll discuss what your fears are. 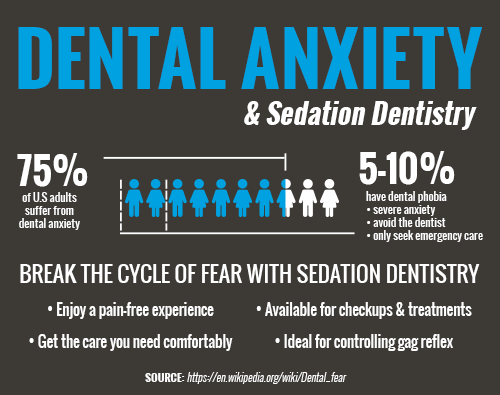 Sedation dentistry can help you face your fears and get to the end of your appointment before you know it. Nitrous oxide, frequently referred to as “laughing gas”, is a safe, effective sedative mixed with oxygen and inhaled through a small facial mask. It produces warm, fuzzy feelings within minutes. You may also experience tingling throughout your extremities (arms and legs) and some light—headedness. These effects wear off as quickly as they began when the mask is removed. If your level of anxiety is deeper, or you’re in need of a slightly more invasive treatment that will have you in the dental chair a bit longer, we can help you relax with oral sedation. An oral sedative is a prescription pill you can take about an hour before your appointment to take the edge off your fears. This will require you to have transportation to and from our office. You will remain conscious through oral sedation, but you may not remember the procedure or notice the time going by before your work is complete. Before you know it, you’ll be on your way home to heal. If you have any questions about sedation dentistry or you’re ready to schedule a consultation with your Abilene dentists, Dr. Webb and Dr. Awtrey, give us a call today or request an appointment online. We look forward to helping you relax in the dental chair!